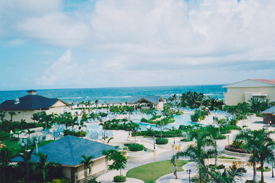 Overlooking the emerald green Atlantic Ocean on the windward side of St. Kitts island, the new St. Kitts Marriott Royal Beach Resort & Spa offers a total of 471 guest rooms, suites and garden houses. Blu Seafood Restaurant - Seafood - Enjoy a true dining experience at our renowned St. Kitts restaurant, featuring the freshest seafood creatively prepared using local and international inspiration in a stunning atmosphere with 180 degree panoramic ocean views. Credit Cards/Room Charge Only. Open for dinner. Dress code: Casual. Royal Grille Steakhouse - American - Warm and sophisticated, this "city-style" steakhouse serves succulent cuts of beef and seafood, along with an international wine list. Reservations Recommended, Elegant Casual Attire please. Credit Cards/Room Charge Only. Open for dinner. Dress code: Dress Jeans. La Cucina - Italian - Specializing in the dishes of Northern Italy, La Cucina delights guests with a beautiful rustic setting and a wide selection of Italian and International wines. (Open for breakfast seasonally). Credit Cards/Room Charge Only. Open for dinner. Calypso Restaurant - American - A popular spot for family dining, Calypso features buffet and a la carte selections emphasizing local ingredients that include fresh fish, fruits and vegetables. Open daily for breakfast and lunch. Credit Cards/Room Charge Only. Open for breakfast and lunch. Dress code: Casual. Bohemia Beach Pool Bar & Grille - International - This casual poolside St Kitts restaurant serves unbeatable salads, burgers, sandwiches and frozen drinks overlooking the beach and ocean. Stay cool at the swim-up bar or under the covered patio. Open for lunch daily. Credit Cards/Room Charge Only. Open for lunch. Dress code: Casual. Cafe Calypso - Other - Enjoy flavored coffee, espresso, sandwiches, snacks and pastries daily at the Cafe, located at the entrance to Calypso. Serving breakfast, lunch and late night dinner. Credit Cards/Room Charge Only. Open for breakfast, lunch and dinner. Dress code: Casual. Pizza Shack - Pizza - Keep it casual with homemade pizza and ice cream served at this outdoor patio restaurant. Seasonally open for Lunch and dinner. Credit Cards/Room Charge Only. Open for lunch and dinner. Dress code: Casual. The Golf Clubhouse Grille - American - Located at the Royal St. Kitts Golf Club, guests can toast to their success on the greens with frosty beers, soft drinks and lemonade. Open for lunch, serving towering burgers, sandwiches and other fare. Seasonal hours. Open for lunch. Dress code: Casual. Lobby Bar - Other - Open daily for those looking for a casual dining atmosphere. On select evenings guests will enjoy live entertainment. Open for dinner. A 15,000 square ft. full service spa, 18 hole championship golf course offering a Nick Faldo Golf Institute.